When first discovered, paleontologists thought the claws were ribs that belonged to a turtle-like aquatic reptile. 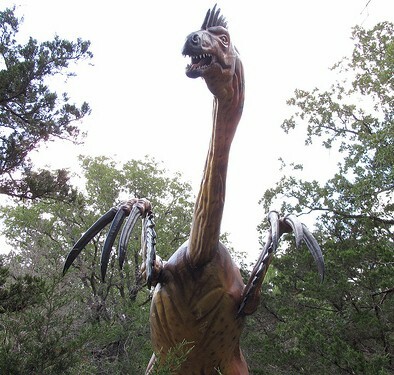 In fact, this strangely large, bipedal dinosaur is called a Therizinosaur. Therizinosaurs are a great puzzle to paleontologists, bearing similarities to both meat-eating and plant-eating animals. This “Scythe lizard” was named in 1954 for its huge 8 feet arms and scythe-like hand claws, which were a full 2 feet in length. It is unclear just how these claws were used. They may have been an offensive weapon or employed in defense against predators. They might have been used to rake branches, or perhaps to dig for insects. This dinosaur’s ponderous body and large claws somewhat resemble the anatomical specializations of the extinct giant ground sloth. Perhaps this mysterious dinosaur had a similar lifestyle to that more recent mammal.